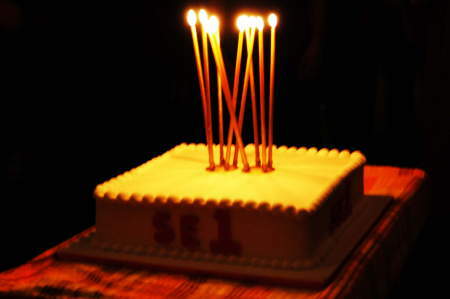 Guests at the birthday celebrations to mark 10 years of the SE1 community website found themselves at the centre of an unfolding drama. More than 200 users and supporters of the website accepted the open invitation to two parties held on 5 and 6 September 2008 in empty railway arches in Great Suffolk Street unaware of what was going to happen once the doors were closed. They were soon rubbing shoulders with a host of characters inspired by the spirit of the SE1 forum - including the vicar, the property developer, the junior doctor, the roadsweeper and the estate agent. Guests were left wondering who or what to believe as a poignant story about regeneration, love and community spirit was told. SE1: The Play was initiated by writer and Bankside-based community activist Camilla McGibbon who developed the project with Lightning Ensemble's co-artistic directors Sarah Weatherall and Marie McCarthy. Thank you to our sponsors who made the event possible. Better Bankside is the UK's third-ever Business Improvement District, the second in central London and the first south of the river. 'Project Bankside' is the working title for a development that will become one of the world's most desirable addresses. The irrepressible regeneration of the South Bank has been a major catalyst behind the city's meteoric rise and its justifiable claim to be the world's premier capital city. Read more about Project Bankside and Native Land. Union Car Parks have car parking sites through SE1 in Southwark St, Bermondsey St, St Thomas St and Great Suffolk St. UCP are happy to support the SE1 party. To hire the arches for a future event, please contact Sue on 020 7357 6799. The Financial Times, one of the world's leading business news organisations, is based at Southwark Bridge. We have been part of the lifeblood of London for over 60 years, and are instrumental in building its future.